Are you searching for a Mother’s Day gift for a mother of young children or a touching baby shower gift? Perhaps you yourself are in need of some uplifting encouragement on your motherhood journey? 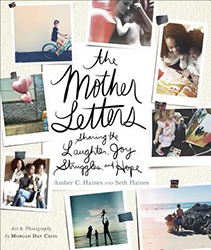 If so, The Mother Letters: Sharing the Laughter, Joy, Struggles, and Hope may be the perfect book. Back in 2008, Amber Haines was the mother of three children under three years old. Her husband Seth wanted to create a meaningful Christmas gift for her and reached out to mom bloggers on the internet to write letters on the topic of motherhood. Seth shares, “I hoped the letters would include words of encouragement and mothering wisdom while perhaps providing Amber a toehold for the hard days. . . Over the next two months, letters poured in. Each letter represented a particular narrative, a different story.” I was one of the moms who responded to this original request. In 2012, some of the letters were compiled into an e-book and now Revell Publishing has created a gift book out of them. These letters are beautiful and heartbreaking. They speak of the good days and the hard days, the sleep-deprived nights, and the feeling that children grow up so quickly. There are letters from expectant mothers and mothers of grown children and everything in between. There are letters from adoptive mothers and step-mothers, those who struggled with infertility, and those who found themselves unexpectedly pregnant. Each mother shared a piece of herself. Read this book with a box of tissues close by. You will laugh and cry and share in the journey. While social media and the “mommy wars” can often pit us against each other – stay-at-home versus working mothers, breast versus bottle-feeding, homeschooling versus public school, free-range versus helicopter, vaccinate versus non-vaccinate, this book offers us the all-important reminders that we are all in this thing called motherhood together and that God is in charge. I was honored to be a small part of it. This garden statue was listed on Amazon as Design Toscano Madonna's Garden Blessings Statue, which is partially true since the young girl in the image is our Blessed Mother. I have never seen a garden statue of St. Anne before, and I'm thrilled to have it in my garden as Anne is my confirmation name and she is one of my patron saints. I think it looks lovely! Leonard Pitts Jr. is a syndicated columnist whose columns appear in my local newspaper. I don't always (or even often) agree with him, but his columns offer reasoned arguments (as opposed to angry rants) and provide insight into how someone who sees the world differently thinks and that is always a good thing. One of the issues we disagree on is abortion. He has always been strongly pro-choice. How many baby bumps — wife, daughter, daughter-in-law — have I put my ear to or touched in awe, wondering who this new person will turn out to be and what things she will bring into life? Baby love is not exclusive to pro-life people. Nor, for that matter, is being “pro-life.” The most ardent proponent of abortion rights favors life, after all, if only because he or she has one. So the very language of the debate creates false distance. The iconography does, too. In recent years, abortion foes have taken to brandishing gruesome placards of dismembered fetuses to make their point. Those things never come close to persuading me. They never leave me feeling anything but angry and assaulted. Boom. There you go. No need of weighty, philosophic discussions about the soul or when life begins. I wanted to reject that sign the way you reflexively reject anything that doesn’t agree with you, but I never could. This is where we pro-life people need to reach people. With the prevalence of ultrasounds today, everyone can see the life inside the womb. We need to appeal to the shared humanity of the people both inside and outside the womb. Most people who are pro-choice are not in favor of the mass murder of innocents (there are exceptions). Rather, these people actually believe that they are doing something good for women. They are misguided, not intentionally evil. These are the minds and hearts we can reach and change, one at a time. Abortion stops a beating heart. The painful truth speaks for itself. In Revolution of Mercy, Bonnie Landry argues that there is a better way to parent and discipline (teach) children than through using rewards and punishments. That way is via "compassion, consolation, and tenderness." St. Pope John Paul II wrote in "Familiaris Consortio" that the "mission of the family is to 'guard, reveal, and communicate love." Landry acknowledges that it can be easier to love and respect and affirm the life of babies, the elderly, the infirm, and pretty much anyone living outside of our house than it treat our own children with love and patience. Why is that? Because we are not responsible for how all those people turn out and those people (usually) are not trying our patience on a daily basis. Landry urges us to "remind ourselves of the dignity of our own children" and treat them accordingly. We get angry at our children because we do love them. "Our reactivity comes from the great chasm we see between our desire for them to become ideal adults and how few of those qualities they manifest at the age of two or seven or twelve." Working on reacting in a loving, positive manner requires daily efforts at self-control and a whole lot of prayer. We need that grace from God. Landry emphasizes that a kinder, gentler approach does not mean condoning or permitting bad behavior, but rather shaping their character through example and a positive relationship. We need to "walk beside" our children, "to accept, ponder, and offer wisdom." When our children wrong us or others, we need to forgive them. "We do not condone the wrong, but forgive their sins in charity." As Landry points out, she has "never, ever regretted being kind." 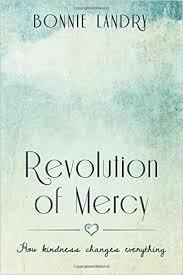 In Revolution of Mercy, she makes some valid points. It is definitely important to focus on the relationship we have with our children before everything else. I don't know that it is possible to completely take away rewards and punishments as a parenting tool, especially with younger children, but if we focus on developing the the relationship first, we should have much less need of them. Revolution of Mercy is worth reading, especially if you currently have a less-than-ideal relationship with your children. It is firmly based on Catholic teaching and emphasizes the need for prayer and a vibrant sacramental life. It is focused much more on the "why" of parenting this way than in offering practical examples of how to do it. Landry does offer suggestions of other resources for that piece of the equation, but it would have been good to have examples of how one should respond in various situations. Overall, however, it offers much food for thought. A while back, a dear friend posted a meme on Facebook that said, "I wish someone would give me a hug and tell me I'm not as worthless as I think I am." She suffers from a collection of physical and mental ailments. We live quite a distance from each other, but I do what I can to be a good friend and I pray for her daily. I wish I could take away her pain. While, fortunately, I am in better health than her, the sentiment she expressed is certainly one I can relate to. I imagine most people who have ever suffered from depression can understand. People who simply say to "think positive thoughts" have clearly never suffered from true depression when the record player of negative thoughts plays constantly in your mind. You can't escape it, no matter what you do. All you can do is wait for the darkness to lift and the negative thoughts to stop. This can be all the more acute in this age of social media, when every post reminds you of how worthless you are compared to others. In 33 Days to Merciful Love, Fr. Michael Gaitley reflects on those thoughts and how they relate to St. Therese's Little Way. There will be that self-accusing ache that creeps in and says, "You've not attained a destiny of greatness. You're not important. You're not attractive. You're nothing." . . . We can never do enough to satisfy our craving for greatness and love. . . . But remember, the Little Way is a Little Way of darkness. So, we won't always feel the greatness of God filling our hearts. . . .In fact, most of the time, we probably won't feel it at all, and we'll have to fight to believe that God still loves us. . . .
Mary, the Mother of God, had to eat the daily bread of darkness. Think of that. This most blessed among women lived a hidden life in an unknown little town while bearing the same burdens as countless ordinary people. For instance, she cooked meals, changed diapers, and washed laundry. But in the midst of her hidden and ordinary life, she had an extraordinary faith, hope, and love. . . .
Don't believe the voices of the world that say, "You're not important! You're not attractive! You're not successful!You're not anything!" With the Little Way, the Lord will make us immensely important, incredibly attractive, and wildly successful in his eyes - but we'll have to accept that we probably won't see it. We'll have to accept to be in the dark, to live an ordinary life, and to walk by faith.